Communicating your actions and intentions to other drivers is an important part of driving and it directly impacts the safety of you and those who surround you on the road. Your vehicle is packed with supplementary devices that help you to communicate with other drivers, such as your headlights, stop signals, turn indicators, emergency lights and your car horn. Additionally, there are hand signals that allow you to signal to other drivers even when all electrical systems in your vehicle break down. Even you own a new vehicle that is unlikely to experience such complete system failure, you will still need to learn hand signs for the driving test! Learn how to use all these communication channels effectively! Turn signals is the most effective means of signaling your intentions to other drivers. You should always use turn signals when changing lanes, making a turn, exiting or entering a roundabout. Most states require that you engage the turn signal at least 100 feet (approximately 5 car lengths) before making the turn and keep it on until the turn is complete . 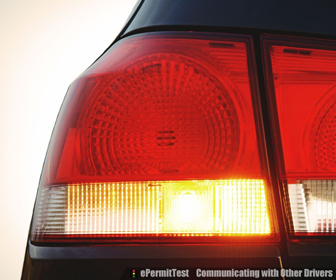 You can also use your turn signals instead of emergency indicators if your car does not have emergency flashers. Many people wonder why they have to learn hand signals if they plan on driving a car that is equipped with turn indicators. 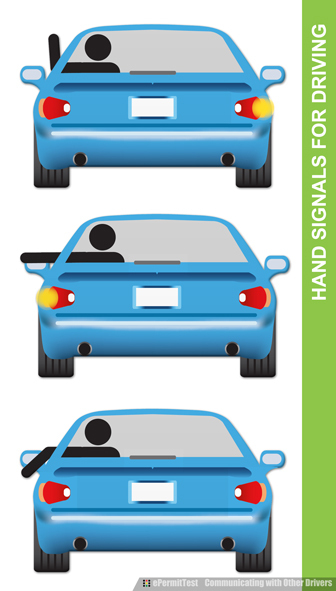 The answer is simple: you have to be able to recognize hand signals when other road users give them and be able to use them yourself should your turn indicators fail. Cyclists always use hand signals since they simply do not have any electric or mechanical turn indicators. Most states also advise to use hand signals when you are driving in bright sunshine or when a line of cars following you could obscure your turn signal light. You must also learn these hand signals for the driving test, signaling turns with hands is part of the standard driving test at most DMV offices around the country. Today, only Kentucky motorists are not expected to use hand signals, but they are still expected to recognize them. 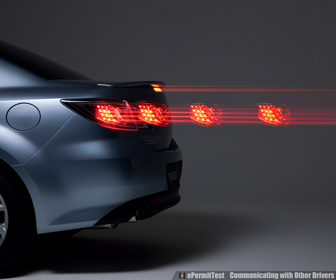 While headlights were designed to help you see better at night and to help other people see you, they can also be used to attract other driver's attention. 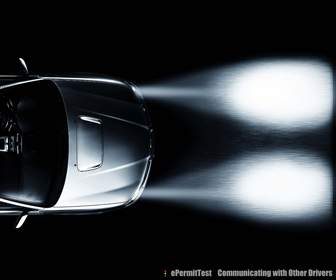 Your headlights are especially useful if a vehicle come toward you with high beams on. If you find yourself in this situation, flash your headlights quickly a few times to warn the other driver of the issue. If the other driver fails to respond, look towards the right side of the road, this will help you to avoid being blinded. You should not try to get back at the other driver by switching to high beam, this may place both you and the other driver in danger. The car horn is meant to be used only for emergency situations, it is not means of self expression and you should always, ALWAYS use it sparingly. You are allowed to use the horn to avoid collisions and to get the other driver's attention when you need to establish contact. You should not use the horn to urge cyclists to go faster or to alert other drivers of minor mistakes that would not evolve into a dangerous situations. We will cover all do's and don'ts of signaling with the car horn in more details so you will know exactly when to use car horn and when not to use it. Signaling with brake lights is required when someone is following you too close and you need to slow down or come to a complete stop. Instead of hitting the brakes rapidly, tap the brake pedal lightly a few times to flash your brake lights. This will allow the other driver to merge or increase the following distance.